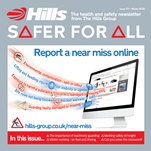 Click here to read the updated Hills Group Privacy Statement. This site may at times store and/or capture personal information where these have been supplied willingly by you as a web user. We will only use the personal information you provide to respond to specific enquiries about our business or to contact you about our products and services and future promotions or news that you have opted in to receive. Any personal information you give us via this website will be held securely and remain the property of Hills Group and will not be sold or rented to any third party or used for any purpose other than as stated above and in accordance with our privacy statement. The cookies used on this website have been categorised based on the categories found in the ICC UK Cookie guide. A breakdown of the cookies used on this website by category is set out below. Category 2 cookies: These cookies collect information about how visitors use a website, for instance which pages visitors go to most often, and if they get error messages from web pages. By using our website, you agree that Hills can place these types of cookies on your device. These terms are governed by and will be interpreted in accordance with the English courts. The English courts shall have exclusive jurisdiction to settle any claim or dispute which may arise out of or in connection with these terms and conditions. Your continued use of this Website indicates your acceptance of these terms and conditions, which include our Copyright and Disclaimer, Privacy and Data Protection Policy Statement. Any personal information you give us will be held securely and remain the property of Hills Group and will not be sold or rented to any third party or used for any purpose other than as stated above.